Product prices and availability are accurate as of 2019-03-30 14:59:23 EDT and are subject to change. Any price and availability information displayed on http://www.amazon.com/ at the time of purchase will apply to the purchase of this product. 2011-2012 UK KY Wildcats Multi Signed 8x10 Photo. The signatures on this photo are authentic and the photo comes with a certificate of authenticity. 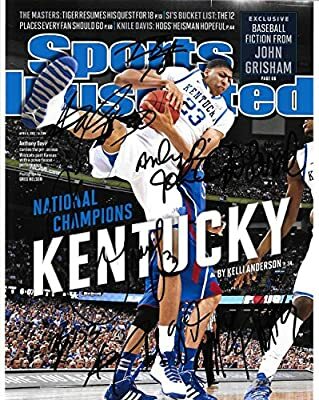 THIS PHOTO HAS 11 SIGNATURES AND THEY INCLUDE: John Calipari, Anthony Davis, Twany Beckham, Eloy Vargas (2x), James Young, Darius Miller, Doron Lamb, Terrence Jones, Kyle Wiltjer, Michael Kidd-Gilchrist, Marquis Teague.